This history of No. 2 Commando was compiled at the request of The Commando Veterans Association, who wanted a record of the unit’s activities and first-hand recollections of its members as seen through the eyes of a No. 2 Commando veteran. There was a certain urgency about the request because this veteran, turned author, is old and just about one step away from the knacker’s yard. There is much to tell about the No. 2 Family and its Father, Charlie Newman. Read more about each Commanding Officer below. 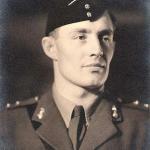 Continue reading our history of No 2 Commando here 'Some of the Men'.